My tastebuds are finally back in working order and after several days of doctor ordered REST, I was in the mood for good food. But what? The start of immunotherapy was delayed and I’ve been resting at home all week, so when my doc said I could resume light activity, I was anxious to dine out. Our favorite Indian restaurant closed last year and we’ve never found a suitable replacement. There’s a place about five minutes from home that has always had a questionable reputation and looked like a dump, so we’ve never been there. But last week, I noticed it had a stylish new sign outside and the building had been painted. Same name, Bombay Oven, but a new look. So we looked on Yelp and sure enough, just a month ago, it reopened with a new owner, new chef and a remodel. It had several five star reviews on Yelp, mostly for the lunch buffet and the comments said to ignore all reviews prior to last month. We decided to take a chance. We arrived at 6:30pm to an empty dining room. That always makes me wonder if we’ve made a bad choice when there are no other customers! But at least if it’s bad, we should be able to make it quick if there aren’t any other people to slow down the service. Our server was very attentive and eager. He wasn’t convinced we’d eaten Indian food before and wanted to explain the menu. He suggested an appetizer, nizza, that he said was a specialty. It didn’t sound very Indian to me, but it did sound good, so we took his advice. We had almost decided not to order our favorite dishes from our old restaurant. We thought that wouldn’t give the new place a fair chance after eating the other version for over 10 years. But when the server arrived, touting the virtues of their chicken tikka masala, we changed our order to our old favorite, along with aloo gobi. 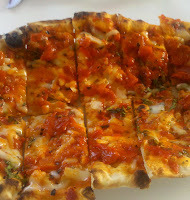 The nizza arrived and was quite delicious. Roasted red pepper relish and mozzarella cheese on garlic naan - Indian style pizza. This would make a great appetizer or quick lunch snack that would be easy to make at home if you have a source of good frozen naan. While we were waiting for our main course, the server brought me a sample for their mango lassi and asked if I’d ever tried it before. I just couldn’t tell him I’d been drinking them for 20+ years. He seemed to think he was introducing us to Indian food. The lassi was rich, creamy and excellent. I really like that you can order your dish mild, medium, spicy or extra spicy. We decided to try spicy since usually we eat these dishes mild and spicy might give them a new twist for the new restaurant. The chicken tikka masala came in a thick, creamy sauce, deeper orange in color than our previous favorite. The chicken was all white meat and exceptionally tender. There were definitely different spices plus the additional kick. I just don’t know enough about the individual Indian flavors to identify what was different. 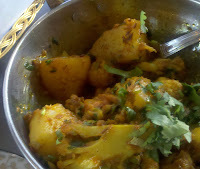 The aloo gobi was different too, but also delicious. There are as many different versions of these dishes as there are chefs. And we’re lucky to have found a new favorite. I'm glad you found a new place to get your Indian fix! We have a couple around and pay them a visit every one in a while. We have place in Montreal we've never been too on our plan for a trip later in the month. Can't wait! I love the look of the nizza! It sounds delicious with red pepper relish. There's nothing like a pick-me-up than a curry! Make the most of this great Indian restau. You're lucky. Indian restaus are not easy to find, never mind good ones. That nizza looks just gorgeou. Had a giggle at you "discovering" the lassi. Hope you're still taking it easy: just keep trying all the different menu items until you're completely 100%. I'm so glad you are doing better, that must be hard. I'm so sad when my favorite restaurant closes. I've never had Nizza before, but it sounds so simple, I want to try it at home. So glad, you commented, I've been collecting urls, I lost so much in the move. Hope you have a great weekend. Thanks for your support, don't worry about commenting, I know how busy everyone is.